Een anti-monarchistisch, radicaal essay in dichtvorm van de Romantische dichter Shelley, de schoonzoon van de radicale, liberale denker William Godwin. Het werk is na 1811 in vergetelheid geraakt en pas in 2006 herontdekt. POETICAL ESSAY ON THE EXISTING STATE OF THINGS. ON THE EXISTING STATE OF THINGS. THE following Poem is such, as some might conceive to demand an apology; it might appear to those, who do not consider with sufficiently accurate investigation, that its ultimate view is subversive of the existing interests of Government. A moment’s attention to the sentiments on which it is founded must demonstrate the erroneousness of this supposition. Before the system which it reprobates can be ameliorated; before that peace, which, perhaps, with greater sanguineness than certainty, every good man anticipates, a total reform in the licentiousness, luxury, depravity, prejudice, which involve society, must be effected. 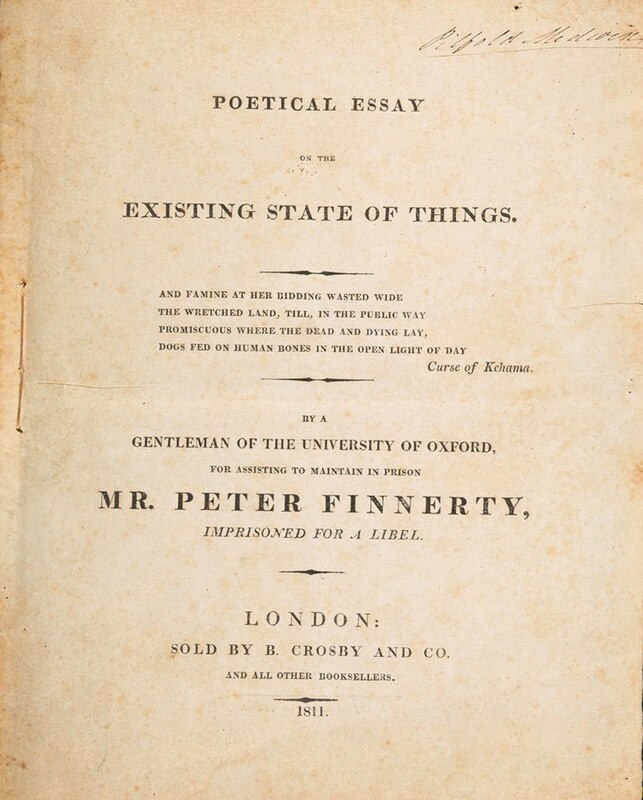 This reform must not be the work of immature assertions of that liberty, which, as affairs now stand, no one can claim without attaining over others an undue, invidious superiority, benefiting in consequence self instead of society; it must not be the partial warfare of physical strength, which would induce the very evils which the tendency of the following Essay is calculated to eradicate; but gradual, yet decided intellectual exertions must diffuse light, as human eyes are rendered capable of bearing it. Does not every feeling mind shrink back in disgust when it beholds myriads of its fellow-beings, whom indigence, whom persecution, have deprived of the power to exert those mental capabilities which alone can distinguish them from the brutes, subjected by nature to their dominion? Is it not an insult to the Allwise, the Omnipresent intelligence of the universe, that one man should, by the abuse of that capacity which was formed to be exerted for the happiness of his fellow-creatures, deprive them of the power to use the noblest gift which his wisdom had imparted? As there is great reason to suppose that degrees of happiness will be adjudged to each, in a future state, in proportion to the degrees of virtue which have marked the life of the individual in this; as it is self-evident that the state of probation in which we now reside, is merely a preparatory stage in which to display our energies, to fit us for a more exalted state of existence, is not the deprivation of liberty the deepest, the severest of injuries? * Yet this is despotism. Vices as glaring as the noon-day sun.—See the speech of one of his Majesty’s ministers in the last Session of Parliament.—The candour of the Right Hon. Gentleman demands our admi- ration, his impudence has ceased to surprise us. shut the door of repentance even upon a murderer, to put an eternal termination to his usefulness in this life, to force him upon an unknown, inconceivable existence, is beyond what we can conceive to be the authority of custom. The morality, if not the necessity of war, must in course be impeached by this argument. If war then is proved to be deleterious, which I think few will deny, then those, in the identification of whom none can hesitate, ought to be deprived of the power of mischief, whose interest, whose desire it is to promote so forcible an outrage on its happiness.